Do you like teriyaki? How about meatloaf? Oh good, because I have found the best of both worlds. I am a little obsessed with Japanese cooking. Sushi, stir-fry’s, don’t even get me started on bento and of course, teriyaki. So, I couldn’t resist this teriyaki meatloaf recipe I slightly adapted from one of my favorite cookbooks, My Japanese Table by Debra Samuels. This dish uses simple ingredients yet is flavorful and satisfying, as is the case with most Japanese dishes. As much as I love eating this cuisine, the boys are less than thrilled at the mention of me craving sushi. Thankfully, everyone enjoys this meal. I’ve never had any complaints and sometimes there is not even enough leftover for my husband’s lunch the next day. There is hardly any prep involved in this recipe and that is okay by me. Mix the panko and the milk together and let it sit for a few minutes so the panko can soak up the liquid. Now the panko is not used in this recipe just because it is a Japanese inspired dish. These nifty breadcrumbs are light and flavorless and will leave you with a better texture and they won’t affect the taste. Save the regular breadcrumbs for topping your casseroles. Make the glaze by whisking together the teriyaki sauce and ketchup. You want to use a nice thick teriyaki sauce here. If you use a thinner sauce your mixture may be too loose and not hold together well and nobody likes a soggy meatloaf. Add in the grated onion, ground meat, a little of the sauce mixture, five spice powder and salt and pepper and mix it up until it is combined. I used ground beef in this recipe but you could also use a mixture of ground beef and pork or ground turkey, if you prefer. There is a Japanese seven spice powder but I have not had the pleasure of meeting her, yet. So, I use Chinese five spice powder here, hope I’m not breaking any laws or anything but it’s good. It’s a mixture of star anise, fennel, cinnamon, cloves and Szechwan pepper and it is sweet and warm and kind of addicting. Try it. Then you form it into 3 mini loaves or one big one if you like it that way. The mini loaves are nice because you can freeze them individually and use them for lunches. Besides, three meatloaves are better than one. Put on your protective headgear, brush on the reserved glaze and pop it in the oven. It’s even better if you can baste the loaves every 10 minutes, and that is the truth. Heat up the remaining glaze and serve it with the meatloaf. We have this with rice and a big green salad. Don’t forget the sake. Preheat oven to 350°. Combine the panko with the milk in a large mixing bowl and let sit until the liquid is absorbed, about 2 minutes. Whisk together the teriyaki sauce and the ketchup to make the glaze. Add the ground meat, onion, 3 tablespoons of the glaze mixture, five spice powder and salt and pepper. Mix until combined. Form into 3 loaves and place in a baking dish. Brush each loaf with the teriyaki sauce and baste every 10 minutes. Bake for 30 minutes and check for doneness. If the loaves are still pink in the middle, cook for 5 more minutes. Heat the remaining glaze and serve with the meatloaf. These are unique and I bet they taste wonderful! 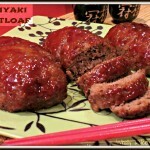 We love Teriyaki and yes, we too love meatloaf so we will be trying these soon! I hope you like them and thanks so much for stopping by! These look great! Love the headgear picture! Thank you for sharing on Thursday’s Treasures! <3 and hugs! Thanks for visiting Debi:) My little guy likes to be well prepared in the kitchen! These sound so good. Thanks for sharing. Liked you on Facebook. Drop by my kitchen for a visit. Oh, this looks so good! Definitely putting this on my menu plan for next week. It is pretty tasty:) I hope you like it! OCEAN Organic Vodka – Ride The Wave!